If you’re looking for a travel destination that’s for your heart as well as your head, there are few better places than Israel. Situated along the Mediterranean Sea, it is one of the preferred religious destinations. Historically, Israel has links to Islam, Judaism and Christianity, and whether you’re religious or not, the majesty of some of the locations will appeal to even the staunchest atheist. If you’re in the mood for a hike, there is no better way to experience the sights and sounds than the Israel National Trail, but be warned; even smaller sections of it may not be for the fainthearted. While it’d be incredibly difficult to cross the full 1000 kilometres, you can pick and choose particular highlights, as long as you bring a bottle or two of water to keep you hydrated. The Jewish faith has been associated in Israel for thousands of years, and as such there are seemingly endless Jewish holy places to visit. 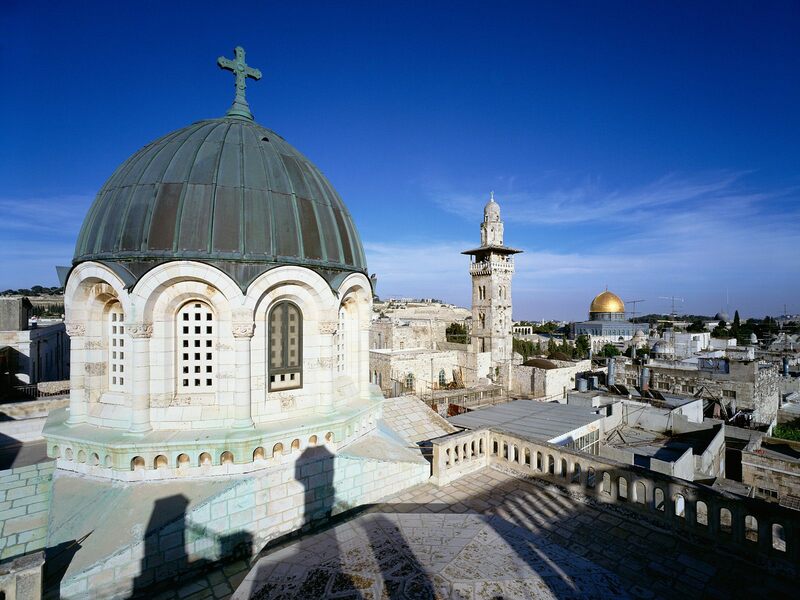 One of the most popular places to visit, Jerusalem contains many different religious sightseeing destinations. The Western Wall is a monolithic structure and arguably the most important and most sacred Jewish site. Founded in the 1st Century, there is much controversy surrounding it – many religious groups have opposing views about its importance and who it really belongs to. Other Jewish sites include the revered Mount Zion, just outside of Jerusalem. Steeped in Old Testament reference, it is a beautiful structure with a similarly beautiful view. For a poignant part of Jewish history, visit the Chamber of the Holocaust for a museum experience like no other. The Mount of Olives is associated with all three of Israel’s most prominent religions, but its Jewish ties lie within the tombs and the prophecies that it has inspired. A stunning view from the top, and a remarkable landmark to visit. In terms of Christian holy places, there is the impressive Church of the Holy Sepulchre; which is the site of Jesus’ resurrection. The atmosphere and energy surrounding such an important place to the Christian faith is palpable. Another important site for Christianity is Bethlehem, the birthplace of Jesus Christ. A shrine near Jerusalem, the Church of the Nativity has much to explore, and whether your interest is religious or architectural, you will be fascinated for hours. A final stop off for those looking for Christian sites is Nazareth, the home of Jesus Christ in his youth. Many of the important sites are connected by The Jesus Trail hike around the most important sites in Nazareth, so attempt this over a few days if you’ve got the time. Finally, there are the Islamic destinations. While not as common, Israel still boasts some of the most spectacular holy places for Muslims. The site of the Al Aqsa Mosque is a sacred pilgrimage for the Islamic faith, almost on a parallel to visiting Mecca. There are also a number of mosques in Nazareth including the White Mosque which lays claim to being the oldest in Nazareth and contains a museum of interesting information and exhibits about Nazareth’s varied history. For a Muslim shrine, there is The Dome of the Rock in Jerusalem. While it remains sacred to both Jews and Muslims, the Islamic history places it is a pilgrimage for those who wish to honour Muhammad’s ascension into heaven. Once more, the architectural significance of such a monument is key to its beauty – the dimensions of it are stunningly accurate, while the coloured tiles are a thing of beauty. Inscriptions adorn its surface and further add to the history it is associated with. One important thing to remember in Israel is how important it is to respect the local customs. Dress modestly and maintain a respectful, peaceful attitude. Islamic sites may require you remove your shoes and ask that women wear a headscarf, while men are required to wear a head covering in Jewish areas. Keep your phone on silent or off if you can, and definitely around holy sites – imagine how awkward it’d be for it to start ringing loudly! As long as you stay aware of your surroundings and the rich history that Israel offers, you’ll be prepared for anything. Israel boasts some of the most stunning areas for religious trips, and regardless of your own beliefs, you will have a fascinating visit ahead of you.